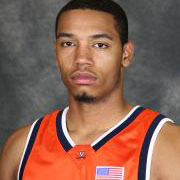 Former Virginia standout Mike Scott was selected by the Atlanta Hawks in the second round of the 2012 NBA Draft on Thursday night. Scott was the 43rd overall pick of the draft. Scott is the first Virginia player selected in the NBA Draft since Sean Singletary in 2008. Singletary was a second-round selection (42nd overall pick) by the Sacramento Kings that year. This season, the 6-8 Scott earned third-team All-America honors from Sporting News, Basketball Times and NetScouts Basketball, fourth-team All-America honors from College Sports Madness and honorable mention All-America recognition from The Associated Press. A 2012 first-team All-Atlantic Coast Conference selection, Scott has also earned all-district honors from the U.S. Basketball Writers Association and the National Association of Basketball Coaches. The Chesapeake, Va., native averaged 18.0 points and 8.3 rebounds a game for the 2011-12 season, while shooting 56.3 percent (215-382) from the field and 80.8 percent (139-172) from the free-throw line. He ranked first among ACC players in field goal percentage, second in scoring, fifth in rebounding and seventh in free throw percentage. Scott was honored as the ACC Player of the Week a league-high four times during the 2011-12 season. He is the first Virginia player to earn the honor four times in one season. Barry Parkhill (1971-72), Ralph Sampson (1982-83), Bryant Stith (1989-90) and Norman Nolan (1997-98) all were named ACC Player of the Week three times in a season. Scott finished his Virginia career ranking third in rebounds (944), third in double-doubles (34) and 16th in points scored (1,538) on UVa’s all-time lists.